Shang Palace at the Shangri-La Hotel, Singapore has just introduced the first of The Chef's Table series and this monthly affair will feature different dishes that are based on the inspiration of the award-winning Executive Chinese Chef Mok Kit Keung as well as the supply of seasonal produce. The Chef's Table series will be held in Shang Palace's private dining room (with a private lounge area) where guests can embark on a six-course epicurean journey with Chef Mok as he shares personal stories and inspirations behind his cooking. Click HERE to find out more about Shang Palace! Thanks to the team over at the Shangri-La Hotel, Singapore, I was invited down to Shang Palace to experience the restaurant's first The Chef's Table series - the menu that you see here is subject to change based on availability of seasonal produce as well as the inspiration of Chef Mok. The first course was a trio of items and it was recommended that we start off this course with the Foie Gras with Kumquat Jelly - this is definitely not something that you will typically see in a Cantonese restaurant but it shows flair and elegance (more importantly, it makes sense). The second component in this dish is the Barbecued Pork Loin glazed with Honey Sauce (also known as char siew in layman's term) - very tender and succulent but most importantly, the honey sauce is not overly sweet and it does not steal the show from the quality of ingredient. My personal favourite in this course is the Pan-Fried Quail Fillet with Lemongrass and White Pepper - I loved the subtlety of the lemongrass and how the quail was cooked so beautifully. The Traditional Steamed Seafood Soup Dumpling is one of the upcoming menu items in Shang Palace and Chef Mok reinvents this traditional dish was is typically served in a bowl of broth. What he has done is to carefully wrap the full-flavoured conpoy stock and with a delicious combination of crustaceans within the massive dumpling's silky skin - eat it with a little light vinegar and ginger on the side to enhance the natural sweetness of the ingredients more! I am one of those lazy diners who do not like bone in my food so imagine my surprise when this Sautéed Boneless Chicken Wing and Frog Leg Skewer with Abalone, Seasonal Vegetables and Yunnan Ham was presented to me this way. At first glance, it looked as if the bones have not been removed from the chicken wing and frog leg but everything on the plate is edible. In fact, I finished all of it fairly quickly because of how delicious it was - the frog leg itself was so good and it reminded me of a particular Sichuan restaurant (not because of the spices but because of the quality of ingredient) back in Beijing that I love. If I had to pick one favourite dish from the whole dinner, it would have to be the French Pigeon done Three Ways with Preserved Vegetables. It is common to find preserved mustard (a type of vegetable) in Cantonese cooking and usually this is done with pork belly. Now this is the very first time that I have tasted preserved mustard this way - Chef Mok has decided to deep-fry it instead of stewing it and that added a new dimension in texture. While the flavours are still pronounced, you do not get the oiliness and drag that you will typically get with this vegetable. Instead, what you have is a simple and clean execution of flavours. The most important component of this dish is the French Pigeon which has been meticulously prepared via three cooking methods – slow roasted, steamed and deep fried. My personal favourite? Deep-fried. No visit to a reputable Cantonese restaurant is complete without a soup and Chef Mok has decided to incorporate this last - this is fairly uncommon since the soup is usually amongst the first few courses in a typical set dinner. The Poached Rice with Star Garoupa Fillet and Crab Meat in Pumpkin and Fish Broth is an off-the-menu item and therefore, if you are coming to Shang Palace just for this dish, you will not be able to find it. The broth is immensely satisfying and the use of fresh star garoupa fillet as well as chunky crab meat certainly made the dish even more enjoyable. 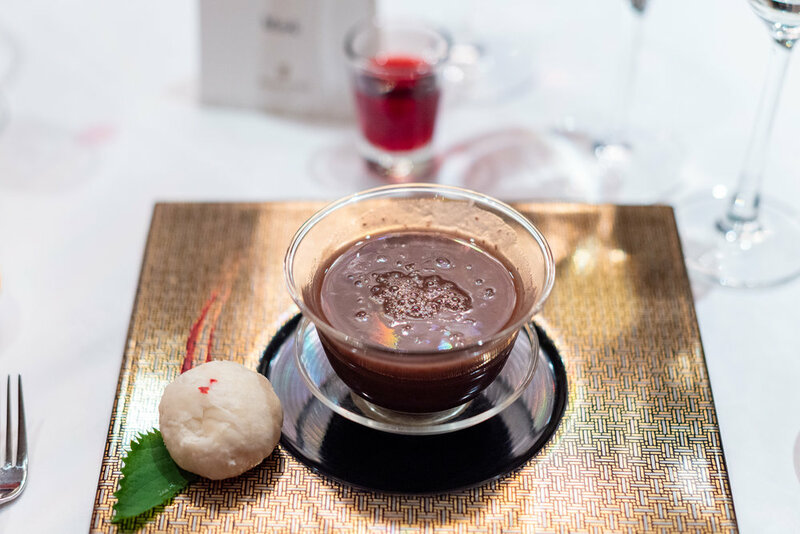 For dessert, Chef Mok has carefully prepared an Aged Tangerine Peel in Sweetened Red Bean Soup as well as a Baked Sweetened Winter Melon Pastry on the side. If you have been to Hong Kong, you must have tried one of the famous Wife Biscuits (or Sweetheart Cakes) from there. While I am typically not a big fan of these confectionaries, Chef Mok has created an incredible version here in Shang Palace where the exteriors crumble with the slightest bite to reveal a harmonious symphony of flavours. The Chef's Table here at Shang palace is a monthly affair and it is priced from S$128++ per person - reservations are definitely necessary.